Getting thoughts out of your head and into your Mac isn’t always easy. All of us have created a new, blank document only to stare at the vast empty space wondering what to do next. Mind mapping aims to prevent those cranial logjams through a process that gets the ideas out quickly, without needless organizational burdens. XMind 2008 Pro (version 2.3) stays true to the mind mapping ideals, though Macintosh standards are the occasional victim. All mind maps start with a central topic. Child branches radiate out from there, using text, colors, and graphic embellishments to articulate the ideas. XMind is a model of simplicity for populating a new map. When you create a new document, XMind enters Brainstorm Mode, creating and selecting the central topic. Adding child and grandchild branches is a simple matter of pressing return or command-return. While pressing return may seem too simple to bother mentioning, the fact is that most mind mapping programs make populating the map harder than it needs to be. Trying to remember an arcane keyboard combination or, heaven forbid, reaching for the mouse can really harsh your mind-mapping buzz. Alas, you can’t avoid the mouse forever. When the brainstorming is over, it’s time to give your plain map a little zazz using Drawing Mode. Here you can apply backgrounds, format shapes, fonts and colors, and graphical elements. Icon size markers are one of those graphical elements. Adding a marker to a topic is a simple drag and drop operation. Adding custom markers ought to be a drag and drop affair too, but requires a trip to the preferences and the use of a clunky interface that doesn’t even let you see what you’re typing. Any image can be dragged into a topic from the Finder, and XMind even facilitates grabbing images from the Web through a built-in browser. Select a topic entitled, say, “microscopic crustacean”; when you choose to insert an image from the Web, you’ll be looking at a microscopic crustacean in Google Images—a nice touch. XMind comes up short on interface design. Like many multi-platform products, XMind runs on Mac OS X, but doesn’t feel as comfortable as software that uses Mac design patterns. Placed side by side, XMind for Mac and Microsoft SQL Server Management Studio Express for Windows were clearly separated at birth. One window, three or four panes, tabs in each pane—this is a classic (and wanting) Microsoft design pattern. Color palettes are straight out of Excel, including the Automatic option; thankfully, clicking Custom opens the standard Mac color picker. Font management also bypasses Apple’s tools in favor of a toolbar-like configuration that doesn’t offer previews. None of these design choices are inherently wrong, but they don’t deliver the Mac experience. 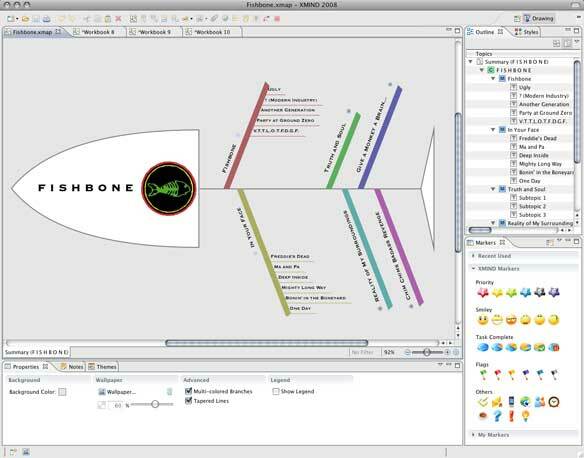 XMind goes beyond mind maps with templates for org charts, flow charts, and the aptly named fishbone chart. Interface design aside, the overall user experience with XMind is satisfying. I encountered no freezes or unexpected quits in daily use on a MacBook Pro. Performance was excellent too. Even when importing and exporting complex documents, XMind never threw up a pinwheel. XMind isn’t just for mind maps. Organization charts, flow charts, project management charts, and Fishbone charts are offered as well. All of the chart types share the same tools and formatting options, so there’s no significant learning curve to prevent you from making full use of all of them. Yet for all its various chart types, XMind does not allow free-form charting. Everything must be performed in the context of the five supported chart types. The migrating mind mapper has limited options when switching to XMind. MindJet MindManager ( ) and FreeMind are the only file types XMind can import. In my testing, XMind ably converted complex MindManager documents. Upon import, core mind map elements were faithfully converted with correct placement and formatting, though some background colors mysteriously changed. XMind also turns poster-style background images into tiled backgrounds, the only background style it offers. Importing documents from the open source FreeMind yielded similar results. With a modest amount of tweaking, the imported map looked as good or better than it did in FreeMind. It’s unfortunate that XMind doesn’t import from other competitor products, and can’t read documents formatted in OPML or any other XML standard. Exporting is a more satisfying experience. XMind capably exports to HTML, PDF, MindManager, and a variety of image and text formats. While the export results are satisfactory, the user interface again parts ways with Mac standards. Both importing and exporting utilize a wizard-style interface with Next and Finish buttons that any casual Windows user will recognize immediately. Wizards have their place in the computing universe, but they’re overkill here. XMind Pro 2008 (version 2.3) shines as a mind mapping tool that doesn’t get in the way as the ideas come flooding out of your head. The mind maps and other charts it produces are attractive and simple to create. Sticklers for Apple’s interface standards won’t warm to the busy design, and anyone with a significant investment in an unsupported import format can move along. But new mind mappers and those not crazy about MindManager or FreeMind should give XMind a shot.